Side-lace at the waist and zipper down the legs allow for easy on and off. Sizing allows wearing over regular pants. 2 deep pockets on front and 1 back pocket allow for storage. Back zipper allows access into back pocket of pants worn underneath. Unfinished bottom for trimming to the correct size. or cold weather riding. These over pant chaps are worn over regular clothes. The FIM807 has side leg zippers that run the full outer leg length for easy wear. than we can better match your over pant . This FIM807 is for the lean rider only. 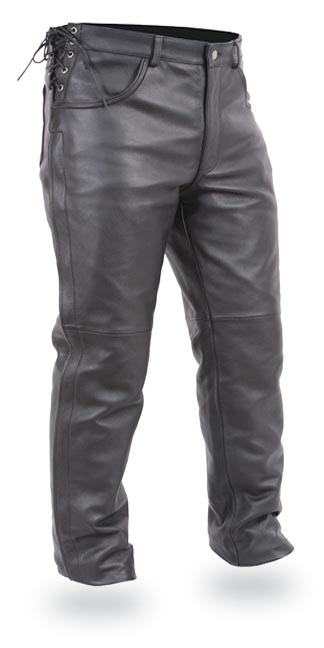 Click the button below to add the FIM807CFD The Commander Mens Deep Pocket Motorcycle Over chap-pant to your wish list.